Enjoy an up-close look at Partners In Health's efforts in Malawi, Africa. Dr. Paul Farmer is an entrepreneur who uses his medical background to fight diseases such as HIV in Malawi, Africa. Dr. Farmer founded the organization Partner's in Health to educate others on health concerns. PIH began in Haiti to provide medical help to lower-economic people. The PIH in Peru has had much success is dealing with MDR-TB. Dr. Farmer together with PIH's have a goal to end health problems associated with HIV and MDR-TB. See how PIH combats diseases by improving social and physical conditions for the people of Malawi. PIH doesn't only treat the disease, the organization also employees those who suffer from HIV, teaches how to plant crops and discusses the housing issues in Africa. 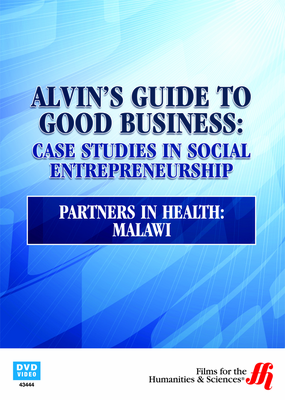 Host Alvin Hall shows you the progress and setbacks of PIH in Malawi. Hall treats you to a look at the finances of PIH and how the organization can improve. You'll also view how the crops are affected by the weather, especially when a drought threatens the progress. View how Dr. Farmer's goals include creating a manual for other PIH affiliates and his desire to establish hospitals for better health care. The video shows you how the community bonds in Malawi lead to social and physical improvements.